The fieldwork for the Oregon Slope Project consisted of two cruises in the R/V Wecoma. The first was a two week cruise in October 2005. In the first 5 days, we deployed 6 Moored Profiler moorings along 43 N. The first was placed nearly 24 miles offshore, just west of the continental shelf, and the last nearly 100 miles offshore in the deep Pacific. The rest of the cruise we collected data along the continental slope, using ship-based instruments such as CTDs, LADCPs, and XCPs. Unfortunately, the shallowest mooring was accidentally pulled up by a local fishing vessel, but we were able to recover the majority of the instruments and their data. 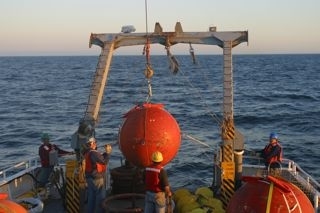 The team returned to the Oregon slope to recover the remaining moorings 45 days after their deployment. We were only able to find 4 of the 5 remaining moorings. Miraculously, one of the Moored Profilers from the lost mooring was found nearly 6 years later and over 200 miles north near the mouth of the columbia river!